Loan is a much-maligned card. In the mid- to late-game, Loans do more harm than good, bypassing your good Actions only to discard your Platinums or Golds. Effective use of the Loan is very situational. First, Loan is a good defensive card. Loans can clear out the Coppers that Mountebanks add to your deck. Attacks that give you Curses are blunted when you can use the Loan to skip over worthless cards. If you plan to gain money through Actions to defend from Pirate Ships, then Loans can also quickly clear your deck of Pirate Ship targets. And if you are being attacked by Ghost Ship, then you can dump useless cards onto your deck in anticipation of using Loan to discard it. Second, Loan is useful when there are ways to turn it into something else, e.g., Remodel, Bishop, Salvager, or Apprentice. Those cards are generally too inefficient at deck-thinning because trashing Coppers provides little to no benefit for them. Here, Loan can clear out the Coppers quickly before getting out of the way and turning into a useful $5 Action, giving 1 VP token, adding $3, or drawing 3 cards. Mines can also turn unwanted Loans into Gold, though Loan sort of anti-synergizes with a Mined deck. Third, as alluded to earlier, Loan is helpful in godawful decks burdened with useless cards, where having to discard a Treasure is well worth being able to skip all the Curses and Victory Cards before it. Of course, this can backfire; in a deck with only one Gold, it can really sting to have to discard it. But in, say, a Goons deck, where you are buying up Coppers for VP tokens, Loan can help get rid of the junk. Alternatively, Loan is quite useful in no-treasure strategies like Minion. Fourth, if Venture is the only good $5, and you anticipate buying several of them, Loans can be indispensable in clearing out your Coppers. The problem is that you might trigger the Loan with the Venture … which then forces you to discard another Venture. The real problem with Loan is that it’s only a card to buy if no viable alternatives are available. In every respect it is out-classed by something else: Reaction cards are better at dealing with attacks; Chapel is better for deck-cleansing; Ventures are a better option for getting through the deck; Watchtowers are better for Goons. And unless Loans are the only source of deck-thinning in the game, even the simple Silver is probably preferable. The one aspect that Loan uniquely excels at is the no-Treasure deck. This might be because you are paranoid about Pirate Ships, but more likely it is because you are running Loan/Minion. This entry was posted in Prosperity and tagged loan. Bookmark the permalink. This is the first entry I find myself strongly disagreeing with, so naturally this will be where I chime in. My issue is with the following premise: “deck cycling is good in bad decks because you discard bad cards, and bad in good decks, because you discard good cards”. The thing is, whatever the composition of your deck, the cards that loans makes you discard are, on average, well, average (for your deck). And the cards you draw after them, are just as average (on average). It doesn’t matter. You either skip good stuff to draw good stuff (in a trimmed deck), or skip curses to draw curses (in a pile of junk). Of course, Loan is bad in a deck with lots of good treasure, because the good treasure gets in the way of trashing your coppers, turning your Loan into another Copper. But I wouldn’t mind Loan in a deck with lots of good action cards. I’ll still be able to get to my Copper and trash it, and the skipped action cards will be replaced by other cards that are just as good. This is what I was coming here to say too 😉 The original premise seems to make sense – and I thought that way at first too – but it really is irrelevant how good or bad your deck is. Hmm. I think you’re generally right, but perhaps the point I was getting at was that each time you cycle your deck, it gets significantly better. So Loan provides a way to more quickly get back to the Silvers/Golds you were buying to get yourself out of crap. Does that make sense? I agree that Loan provides faster cycling, which is a good thing in the early game (as Twinge noted). I’m not sure how significant this boost is, but in any case, I don’t think it’s very much deck dependent. The worse my deck, the worse the new cards that I’m buying will be, so the difference between my current cards and the cards I’m cycling towards stays roughly the same. I think the main consideration with Loan is whether it succeeds in trashing your Coppers. This means that it works best in action-based decks, where your acquisitions don’t get in its way, and is bad in treasure decks. While I am generally in Yaron’s camp, there is another consideration when thinking about how good deck cycling is. Assuming you’re deck is still getting better over time, it’s generally good – but is it made better or worse by your overall card quality? As Yaron points out, it seems like not really. However, I would argue that what matters isn’t your average card quality, but how concentrated your card quality is. When your quality is spread out equally through your deck, whether it be of very high or very low quality (say, all curses and silver and gardens, or all minions and markets) cycling is pretty good, and per Yaron’s point not really better in one case or the other. But now consider the case where you have one $7 action in your deck, or one curse-giving attack in your deck – playing that card every time through your deck is probably of utmost importance, ie, disproportionately more important than skipping some crap. *That’s* the situation where ‘blind’ deck cycling like Loan gets a lot worse, especially if your deck is big and you’re not going to see that King’s Court again for a long time. I’ve always thought this to be the worst card in Dominion–and I’ve never bought it in a serious game. This writeup (and the discussion above) inspires me to try and make Loan useful, but it seems as though this will only be true under rare circumstances (no other good 3 cost action buys in a game where getting money from actions is easy and slowly trashing coppers is better than buying a silver?). I’d really like to see a sample game where loan was put to good use. Does anyone have the text from a game in which loan was useful? Love the blog by the way, especially when sample games are included. If anyone hasn’t checked out Theory’s gardens/embargo win, or Curses first sample game in his recent article about patience, you really need to do so. Thanks! Minion/Loan is a good one; you should also look at yaron’s guest article where he talks about how Loan’s “worst-case scenario” isn’t really all that bad. I’m relatively new to Dominion. If you use this card, does it count as an Action? It’s classified solely as a Treasure card, so I’m uncertain if it uses up an action. It does not. It just “happens” when you play the Loan during the Buy phase. Note that you don’t have to play the Loan if you don’t want to. You can always selectively play Treasures, which is helpful for Loan and Mint. Although if Mint is available, Loan has got to be the worst possible thing to buy. Not really. I’d rather open Loan and ignore Mint altogether if both were available. Mint is just something you buy if you happen to have 5+ Coppers in play and Mint is available. Other than that there aren’t many situations at all where I’d care about Mint. It’s hard to see the usefulness of deck-thinning and deck-cycling cards until you play them, and the Loan falls into both categories. The downside of the card is that luck plays such a huge factor – will you draw to a Copper, or a Platinum? 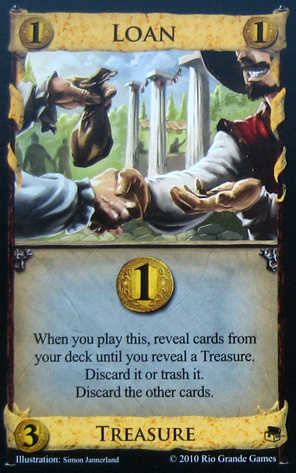 But it’s a great card for any strategy where you’re looking to gain $ with actions and not with treasure cards. For example, Worker’s Village/Loan is a great starter if you want to buy up all the Peddlers. Discovered a new conflict today for this card. Played on a board with only one $4 card (Bureaucrat), and one $3 card (Loan), and I got a 4/3 start. (My opponent got 5/2 and out to an early lead.) Of course, I drew the Bureaucrat and the Loan in the same hand, and didn’t want to trash my silver, so had to skip playing the Loan. That happened a couple times early on. OTOH, late in the game, it was nice to be able to use the attack power of Bureaucrat without worrying about either cluttering my deck with Silver or hitting a Platinum with my Loan. Opening with Bureaucrat/Silver would be better opening in your case. Loan let you choose either trash or discard revealed treasure. If happened to draw Bureaucrat/Silver so you could play Bureaucrat for silver and attack and Loan for 1$ and discard revealed silver. Courtyard and lookout also work very well with this card. Can return green cards to your deck to get discarded, or return coppers to get trashed. Anything that let’s you control what is on top of your deck is great. Good catch, especially since you don’t mind that Courtyard is a terminating action. It is a very hard card to control, since you don’t know what lies ahead. I would never use it not even if I planned a chain to know the next 5 cards. I only see it as a secured Copper trasher and only early in the game before you get to Silver or higher. You can play the whole game without Silver/Gold/Platinum on certain boards. “you don’t know what lies ahead” ist not always true. Take Navigator for example. A nice opening is Navigator/Loan. With a loan in hand, you should almost never discard the cards revealed by the navigator, but rearrange them to make loan skip junk and trash copper. Dunno about that. This takes the generally strongest bit of navigator and throws it away. Of course you do get some compensatory benefit, but the bigger issue is that both cards, and especially navigator, are weak. Which isn’t to say this is never good, but not very often so, I don’t think. great idea, but the logistics of owning a pet came be very tricky.